See the 'City That Never Sleeps' under a blanket of stars in this beautifully rendered digital print. One could say that a vital part of connecting artist Bianca Green's life is the cosmos. Born in Rio de Janeiro, Green has lived all around the globe, including stints in Berlin, San Francisco, and Montevideo, Uruguay. Her latest piece shows America's most iconic city - New York - under a stunning blanket of colorful stars. 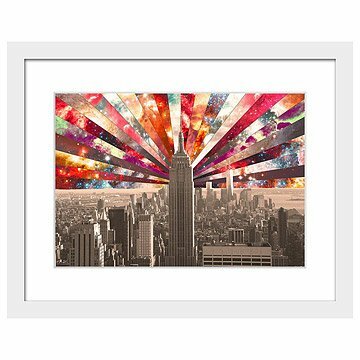 Mixing photographic realism with digital wonder, this stunning piece of art is printed on acid free paper, perfect for bringing an ethereal touch of city life to your home. Made in Berlin, printed and framed in Portland, Oregon. Arrives framed and ready to hang in white BonanzaWood frame, or matted in white acid free mat. This print not only gave a former new Yorker now southerner a nostalgic proud twinge but is vibrant and happy as well.